Harman Kardon has taken an old favorite and has given it a total makeover with the new and improved GO+PLAY wireless speaker for 2016. Designed to provide a rich and room-filling audio experience with its set of six high-performance drivers, the new GO+PLAY is a weighty Bluetooth 4.1 wireless speaker you can still pick up and carry with you to your next destination thanks to its large internal battery capacity, which Harman Kardon says will last up to 8 hours. While it isn't its most expensive speaker on offer, the GO+PLAY is Harman Kardon's most powerful and perhaps even the best sounding portable speaker yet. So how does it stack up against speakers like the JBL Xtreme, Vifa Oslo, B&O Beoplay A2, and the Marshall Kilburn? You're about to find out! While you can use the built-in USB output to charge external portable devices such as your smartphone or tablet using the GO+PLAY's internal rechargeable battery (a feature that is also found JBL's Charge 3 portable speaker), you'll need to use this included charging brick to charge the speaker itself. Not as convenient as using a USB cable, but at least you'll be able to fully charge this thing in just 3 hours. After that, you can expect to get up to 8 hours of wireless use out of the GO+PLAY depending on the volume level and music you listen to. 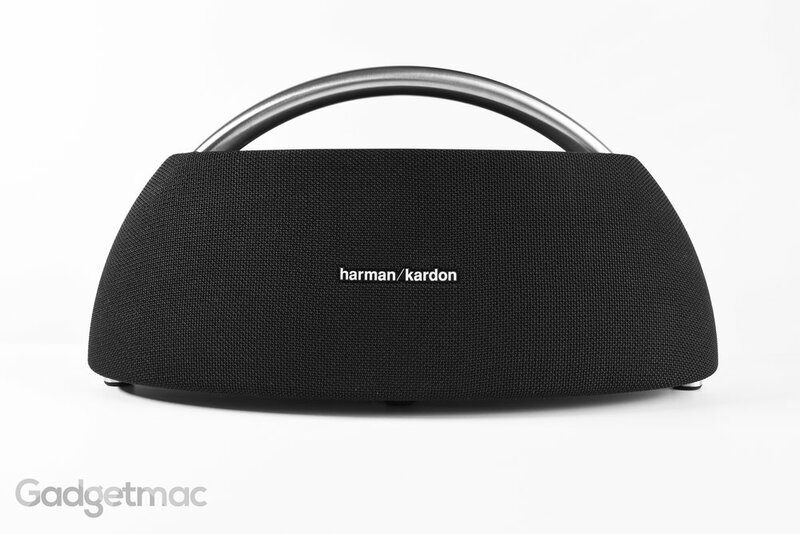 Harman Kardon's battery claims greatly decrease when using the speaker at high volumes, in which case you should expect around 3 hours of use before having to charge again. But that's not such a bad result when you factor in how powerful this wireless speaker actually is. 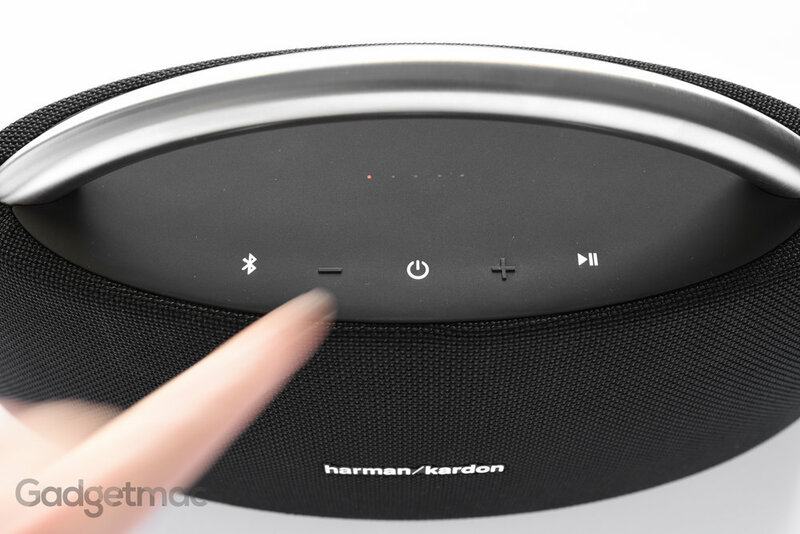 Harman Kardon's GO+PLAY isn't exactly a cheap wireless speaker coming in at $400 (available only in black or white). That's $100 more than what you'll pay for JBL's (a Harman owned company) Xtreme, which sports a water-resistant design – and as far as portable speakers go – shares a similar humongous footprint as the GO+PLAY...which isn't that portable in the sense that you can effortlessly carry one around all day long. Although billed as a portable wireless speaker, the GO+PLAY isn't exactly as compact as your standard pick-up-and-throw-in-your-gear-bag type of a portable. The new GO+PLAY wireless may be much lighter and a lot more refined than its predecessor weighing in at 7.5lb, but that's still quite a hefty load so expect to make you some extra gains when carrying this thing around. For size reference, the GO+PLAY dwarfs one of our favorite portable speakers from JBL - the Charge 3. However, it's in a totally different class both in price, sound performance and even durability. There's no comparing the two as they are both intended for different lifestyles. There's nothing physically wrong with the GO+PLAY's build quality, but premium it isn't. Yes that brushed stainless steel handle is a svelte design feature that also happens to offer a functional part rather than just a styling detail, but the use of plastics and this mundane nylon fabric everywhere else doesn't make this a stand-out speaker next to a plethora of wireless speaker models from other manufacturers. And this price point we would have expected a bit more design details and higher quality, unique material choices. Harman Kardon calls this a premium fabric and I'd have to disagree with that description. A premium fabric isn't this nylon material but a unique Kvadrat textile like the one found on Vifa's Oslo portable speaker. It is acceptably nice for a portable speaker though. That said, when you come to press down on one of the on board button controls the whole speaker wobbles slightly forward and back due to its uneven feet underneath. This happens on a perfectly even flat surface, which only adds another sense of poor build quality standards for a speaker that is made by a respectable premium audio brand. Out of all the wireless speakers we have reviewed, the GO+PLAY is the first to have a wobbly design when it shouldn't. It's worth noting that this doesn't have any affect whatsoever on the performance of the speaker. Fortunately there isn't any rattling or wobbling made by the speaker itself when it is playing loudly. At the top of the speaker we have this rubberized flat surface with a few button controls including a battery status indicator. You can also use the same play/pause button to skip to the next song and back. Protected by a rubber flap is a series of inputs and outputs. A standard USB output port enables to charge external devices using your own charging USB cable, a micro-USB port is used for warranty servicing, a 3.5mm audio input can be used to connect non-Bluetooth enabled audio sources, and finally the power input used for charging the speaker. 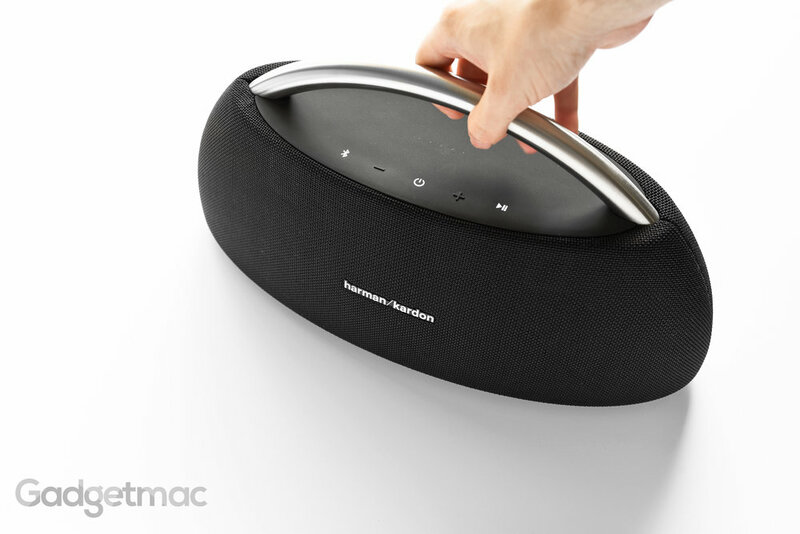 Like JBL’s Connect enabled wireless speakers, Harman Kardon also has its own “multi-room” feature for wirelessly connected two speakers to play the same audio source in separate locations. The GO+PLAY’s Dual Sound mode enables you to pair two speakers together for an amplified audio experience. But unlike JBL’s Connect, Dual Sound doesn’t support stereo streaming using two speakers whereby one speaker will play as the left channel and the other will play the right like a standard dual speaker setup. The GO+PLAY has this very unusual shape to it that turns out makes for a great speaker design which places each speaker driver far apart at the right angles in order to deliver a more spacious sounding audio with a surprising amount of stereo separation for a speaker that is both wireless and portable. It may arguably look somewhat outdated as far as how it's designed as a wireless speaker, but that's not what really matters at the end of the day. What's more important is how it sounds. And how it sounds will undoubtedly give you a goosebump or two. If we were to purely look at audio performance, there is nothing out there that we've heard that sounds better. To put it simply – the Harman Kardon GO+PLAY outperforms every other portable wireless speaker that JBL makes along with a host of other notable brands such as Bose, Fugoo, Marshall, and Sony. Highs have a sparkling treble clarity to them that really shines through whatever it is that you're listening to. The GO+PLAY produces amazingly clear and piercing highs, albeit a bit too piercing for my taste using its two dedicated tweeters. As for the midrange, it does seem to be the most veiled out of everything else, but not in a significant way as it still acceptably detailed. Overall this speakers sounds full, energetic and fun to listen to - especially if you really like your bass to pull through when called for. Speaking of bass, the low-end has a floor rattling response. It sounds deep, deeper than any portable speaker we've reviewed so far. Though if I must be critical here, the GO+PLAY doesn't produce as much of a punchy upper bass as it does with the lower end. If we take a look behind that speaker grille cover we can understand why the GO+PLAY has such a broad sounding profile. The drivers are spaced far apart with two 20mm individual twitters at opposite sides, dual-sided passive bass radiators flanked by two 90mm woofers. The GO+PLAY isn't a 360-degree speaker, meaning that if you are facing the rear then you'll hear audio more muted. However, because it does such a great job at spreading sound from the front and towards the sides, it does deliver a better sound field coverage than a lot of other portable wireless speaker do that aren't omni-directional. The Vifa Oslo is the only portable speaker of its size that can stand up to the GO+PLAY as far as audio quality, but it's also more expensive. Harman Kardon's GO+PLAY produces incredible stereo separation and a broad sound field unlike the Vifa Oslo and Helsinki speakers. Granted it isn't as compact and portable as the Vifa Oslo, however, the GO+PLAY is without a doubt the best sounding wireless speaker we have reviewed on this site. The Oslo impressively holds its own compared to the GO+PLAY but just doesn't sound as rich and provides a narrower sweet spot for listening to audio as best as it can sound due to its constrained form factor. As deep as the Oslo's lows are capable of reaching, the GO+PLAY surpasses them with an even deeper low-end thump. Finally, where the Oslo starts to distort at very high volumes under certain situations, the GO+PLAY keeps a clean and leveled audio performance without any bass degradation which is very impressive when taking about portable speakers. The midrange isn't quite as defined as it is on the Oslo, but that is only noticeable when compared side by side and something you would otherwise wouldn't have been able to easily discern when listening to the GO+PLAY for the first time on its own. 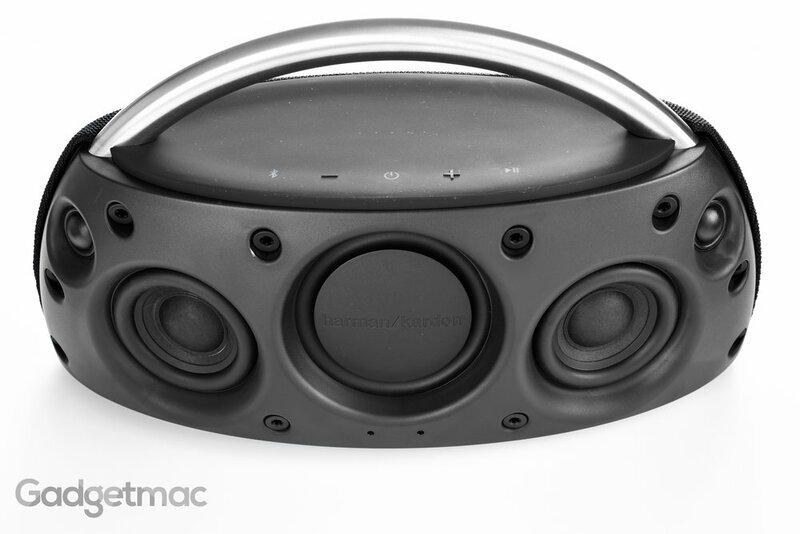 It is a very well tuned speaker all things considered, without any odd DSP interference. The biggest noticeable differences between the GO+PLAY and Oslo is bass and sound dispersion. The Oslo while it comes close, simply cannot match the deep bass and broad soundscape of the GO+PLAY. 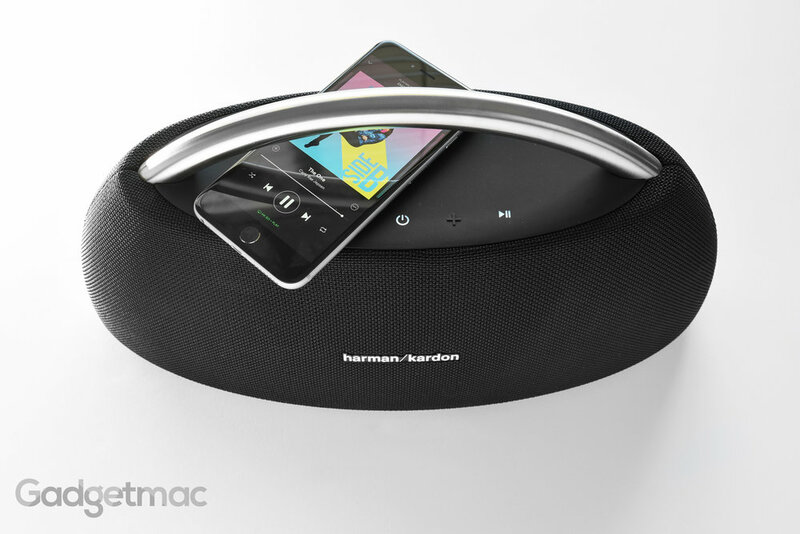 The only downsides to Harman Kardon's new GO+PLAY is shorter than average battery life (when used at high to max volume you'll get less than 3 hours of use), large form factor and the fact that it doesn't reach volumes that are as loud as we had hoped it would compared to smaller sized portables. That said and unlike other portable speakers, the GO+PLAY's controlled loudness is one of its strengths as it doesn't distort and maintains a balanced audio signature at any volume. But if you can live with these shortcomings and in need for a very capable sounding wireless portable speaker, this is one of the very few models you should seriously consider purchasing. It's Harman's best sounding portable yet. And while we really like how it sounds, we don't particularly think it looks all that good. Choosing between these two incredible wireless speakers comes down to three things: size, build quality and price. If you carry around your speaker a lot and prefer the best build quality and design, Vifa's Oslo is the portable speaker to grab. But if you'd like something that is just as powerful if not more so and for less money, Harman Kardon's GO+PLAY wireless speaker is hard option to pass up when looking for a full-sounding audio experience with the deepest bass of all. Although not the loudest portable speaker at its size, the GO+PLAY sounds great at any volume, features a decent battery life when set at normal volume levels (50-70%, and offers an elegant portable design that will let you easily move it around without having to worry about external power.